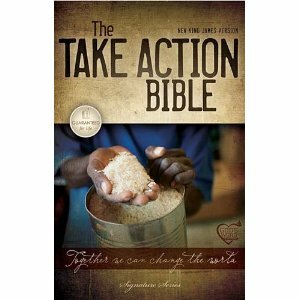 The Take Action Bible, published by Thomas Nelson Publishers, is a full-length Bible in New King James Version. The difference between this Bible and others is that it is interspersed with 48 full-color pages that include 15 true stories from real people. These stories give us examples of how to “take action” with God’s Word. The theme of this Bible is: Together we can change the world. You will “meet” people who have answered God’s call to GO, SERVE, GIVE, HEAL and TEACH. However, it is not insinuating that every Christian must be an overseas missionary. The idea is to help us understand that every Christian should be serving the Lord in some way. Even children can answer this call. In fact, there is a story included in this Bible that tells of 9-year-old girl who set up a lemonade stand to raise money for local flood victims. She raised $34, which is quite a lot for selling lemonade! After each story also comes a Bible reference to look up. (How convenient to already be holding a Bible in your hand.) And, it also includes a couple of thought-provoking questions, as well as a place to write notes. Then, in the back of the Bible, there is also a list of 52 ways to “take action.” The reader is challenged to do at least one action per week, filling an entire year’s worth. A couple examples of these ideas is to (1) hold open a door for everyone you can during the week, or (2) volunteer at a soup kitchen. These could be considered small actions to some, but it could mean a world of difference to the receiver. It’s definitely a neat little concept for a Bible and, in my opinion, would make a nice gift for a young graduate of High School or College. However, ANYONE could benefit from reading it. You can find it on Amazon.com for around $11.00. Disclosure: I received this book free from Thomas Nelson Publishers as part of their BookSneeze.com book review bloggers program. The opinions I have expressed are my own.